• For quantitative determination of urinary protein and creatinine concentrations (protein/creatinine ratio, UPCR). • Sensitive and accurate. Use 20 µL samples. 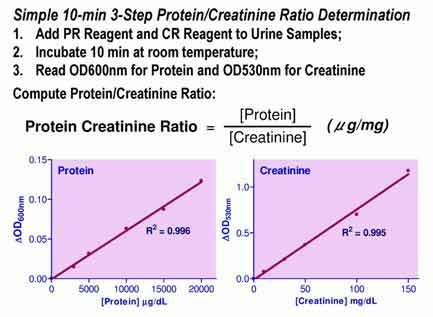 Linear detection range in 96-well plate: 1 - 20 mg/dL Protein and 1 - 150 mg/dL Creatinine. • Fast and convenient. No sample pre-treatment is needed. Simple 10- minute "add-incubate-read" procedure. • High-throughput adaptable. The procedure can be readily automated for processing thousands of samples per day. • PROTEIN is filtered out of urine by the glomeruli of the kidneys. Albumin is the most common serum protein, thus the majority of the protein in urine is albumin. A damaged kidney will allow some protein through into the urine, the less protein in urine the better. Elevated protein levels in urine is called microalbuminuria or proteinuria, which typically arises due to type 1 diabetes, type 2 diabetes, or high blood pressure. CREATININE is synthesized in the body at a fairly constant rate from creatine. In healthy individuals, creatinine secretion is independent of diet and is fairly constant. The creatinine clearance test has become one of the most sensitive tests for measuring glomerular filtration rate. PROTEIN/CREATININE RATIO (PCR) remains the simplest and most convenient test for proteinuria. Other methods such as 24 hour urine test or timed urine test require strict adherence to sample collection protocol. Since the protein concentration is normalized to creatinine secretion, the urine sample can be taken at anytime and no diet or liquid restrictions are necessary for sample collection. 1. Does the assay kit work in a particular species? Yes, this kit works for urine of all species. 2. Do I need to run an internal standard for each sample? Yes, urine varies widely from individual to individual. Depending on the concentration of the urine and the diet of the individual, each sample will respond to the reagent slightly differently. The internal standard corrects for the slight differences thus calculating accurate results. 3. Do I need to run a blank for each sample? No, you only need to run a blank in duplicate for each assay. For example, if you are running 5 samples, you will have 10 internal standard wells, 10 sample wells, and 2 blank wells. 4. Can I store unused reagents for future use? Yes, unused reagents can be stored in the refridgerator until next use. Be sure to equilibrate reagents to room temperature before using again. 5. Do I need to use a standard curve? Why is there no standard curve in the protocol? For assays that use an internal standard, running a standard for each sample would be cumbersome, and would consume large quantities of reagents. It is standard practice to use a one point standard to calculate your values.